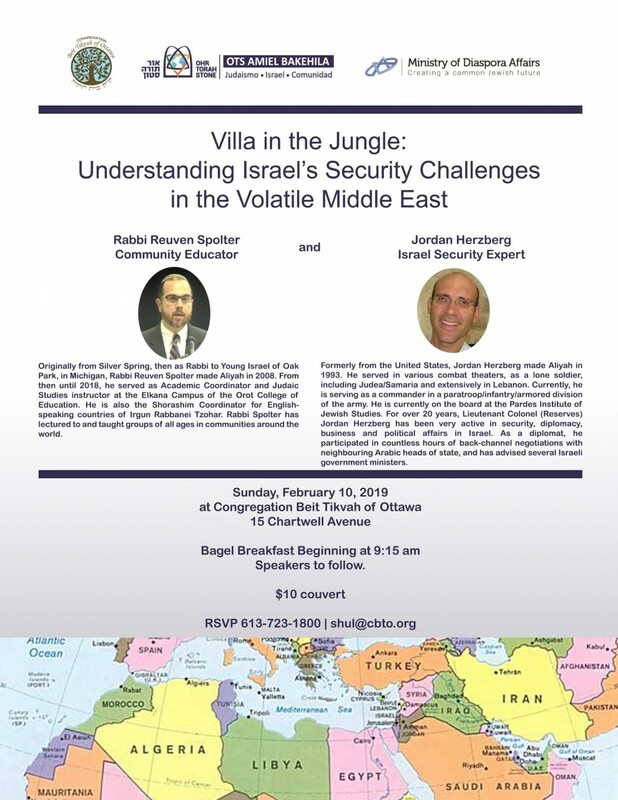 Congregation Beit Tikvah of Ottawa 15 Chartwell Ave.
Congregation Beit Tikvah with Ohr Torah Stone and the Israel Ministry of Diaspora Affairs are pleased to welcome Rabbi Reuven Spolter and Lieutenant Colonel (Reserves) Jordan Hertzberg, who will be speaking about the security challenges facing Israel in a very volatile region. How is Israel managing to overcome and deal with its enemies including Hamas, Hezbollah, Iran and even ISIS? Join us this Sunday, for Shaharit services commencing at 8:30am followed by a full and sumptuous breakfast and our speakers at 9:30.